Bullying has been shown to contribute to poor student achievement, increased school avoidance and absenteeism, and even juvenile crime. Is bullying a problem at your school? It’s goal is to help you manage bully problems for the entire school year. It has been proven to dramatically reduce bullying and it helps create a culture for the prevention of bullying in the future. One time assemblies as a bully prevention strategy does not work. Consistency with bully prevention yields long-lasting results. Two-day workshops contain intensive cyberbullying training. 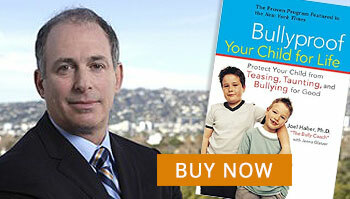 Dr. Haber can also intervene in unresolved youth bullying cases as needed. For unique situations requiring special training and programs, the Dr. Haber customizes a plan for the day-long consultation determined prior to the visit. One-Day Staff Training Program – A day-long program focusing on administrators, teachers, and other educational support staff. Comprehensive Two-Day Staff Training Program – Two days of training with more intensive cyberbullying training designed to help administration, teachers and their students identify, manage, and help decrease bullying in the classroom and the school. Interventions build around ongoing faculty involvement with their students. Please contact us for details and pricing for this program. Sports can be a great avenue for children to develop physically and mentally. However, there is a substantial power struggle that is often overlooked as team building. Aggressive behavior in sports and “leaving it all on the field” can result in bullying that may not be readily identified. Dr. Haber offers and extensive sports bullying program. To learn more, click here.